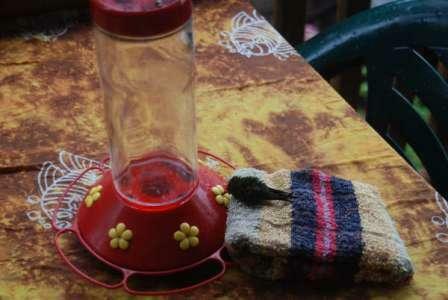 As far back as I can remember Hummingbirds have always held a special place in my heart. They beguile me, when they zip from flower to flower; their slim beaks drawing nectar from each bloom. Emerald feathers, glisten like petite jewels—capturing the prisms of sunlight. No bigger than a ripe purple plum, it would seem that with a single breath, they could be blown over. Yet, (I have since learned) they are strong enough to withstand most of what Mother Nature challenges them with. And they are feisty creatures, ready to defend their territory, and occasionally they could even be called Bullies. 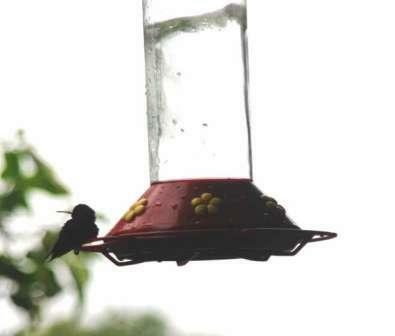 When I lived in Canada, I planted gardens to encourage Hummingbirds to grace my yard. In any given season, if even one showed up, I would have a grin plastered on my face for days—so happy for having had the encounter. 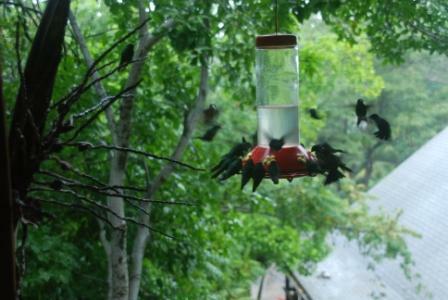 Well now I live on Roatan were there are so many Hummingbirds I can’t keep count! Yup—I’m always grinning. About a year ago during rainy season, I was out for a walk (on Sundancer property, where we live) when I heard an unusual noise coming from a puddle of water. I found a Hummingbird floundering in that puddle. The poor thing had a crippled foot and obviously had lost strength trying to make it to shelter during a storm. 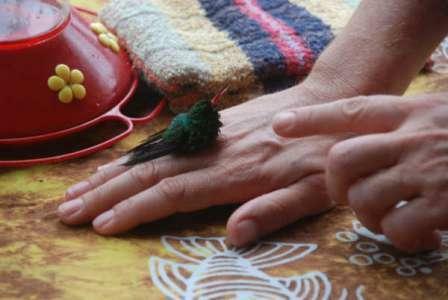 I scooped the Hummingbird up and cradled it in my palm. My heart was pounding from the realization that I was actually touching one of these amazing birds, but also from the fear that it may not survive. 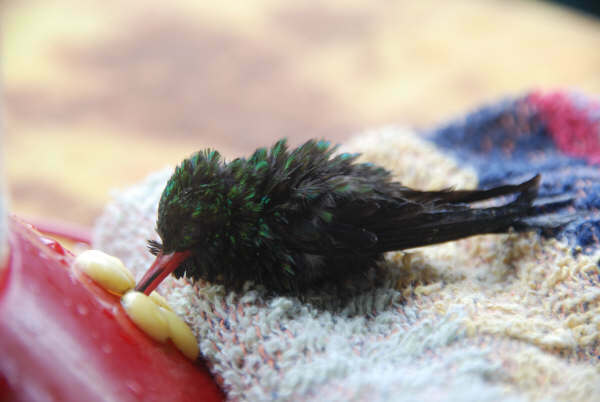 Racing home I laid the little jewel on a towel and brought the feeder to it. Again, gently holding it, I guided its beak into the feeder; all the while, stroking its tiny feathers urging it to take a drink. At first lifeless, it suddenly opened its eyes and started gulping at the sugar water offered. After a few minutes, it tried to wiggle free from my grasp. I set it back on the towel and gave it a stern talking to for scaring me like that. 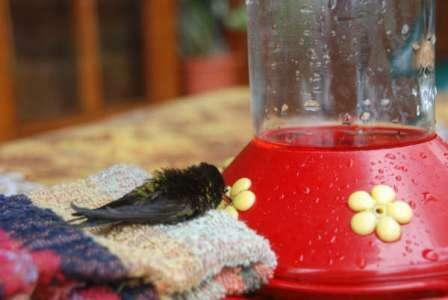 The Hummingbird stayed on the towel, drinking from the feeder for another 20 minutes or so (until it had regained enough strength.) And when it was ready, flew to a nearby tree. It was still a little wobbly, but determined, and a few minutes later came back to the feeder that I had re-hung on the porch. I kept an eye on it for the rest of the day, but the time came when it didn’t return anymore. I can only assume it found its way home. 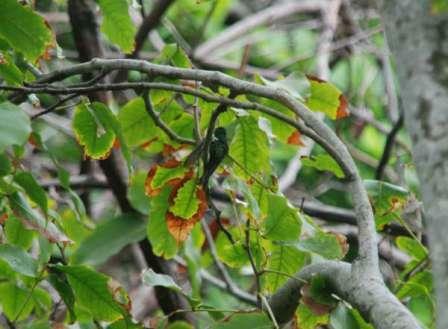 I am very fortunate to have daily encounters with Hummingbirds since moving to Roatan, the following links are to my Travel Pod blog were you can enjoy a couple more noteworthy stories and photos. What a heart-warming story and what wonderful pictures, you sure are talented in story telling and story making. 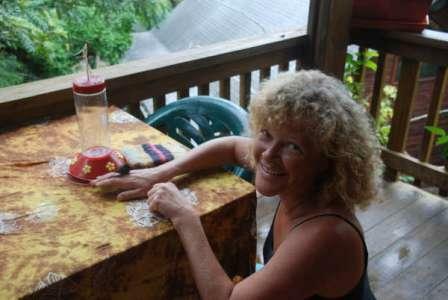 What a beautiful picture of you with the humming bird, I’d say you look a heck of a lot like your momma! This is right up my ally. 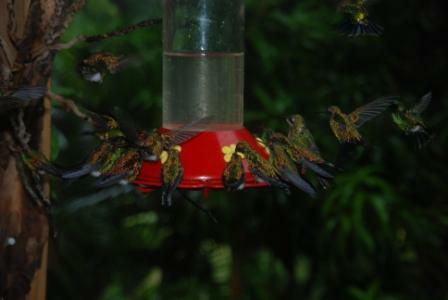 Hummers are my favorite birds to watch. They are amazing! Here in NH we only get a few months to see them and don’t have any varieties that look like yours. We have the ruby-throated variety. Your pictures are great. Glad the little one is alright. Thanks for this great post. Later .. . .